I’ve had an awesome but crazy busy few days, and so as I start writing this I still haven’t iced the cake I’ve made this week. It’s kind of been a disaster. I got up early yesterday morning to make the cake before I spent the day sitting by the River Cam, drinking beer and eating BBQ. I left the ‘chocolate custard’ to make until this afternoon, which I’ve spent at my parents’ house. I’m pretty lucky I did, because otherwise I don’t think I would’ve made the chocolate custard at all. 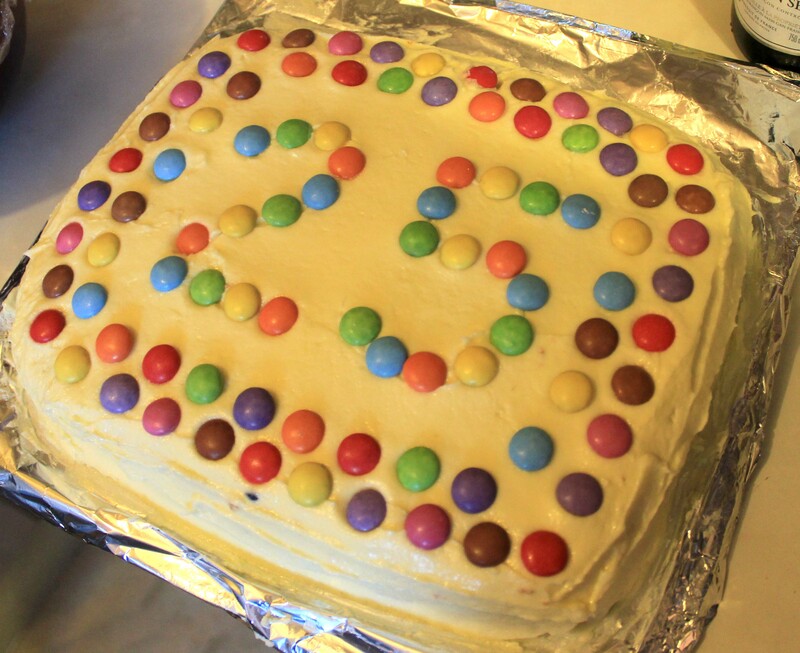 My mum basically made it for me after I had a cornflour-related incident and then kind of gave up a bit. It is now cooling, but still isn’t set. I’m posting this now because the chances are that by the time it is set, it will no longer be Sunday. The moral of this story is, don’t make complicated icing/custard when you’re incredibly tired, and don’t mix water with cornflour like I did – i.e. pouring all the water into the cornflour, then going to stir it and realising it was solid. Panic ensued, and I had to call in reinforcements to salvage it (because there wasn’t another 200g of cornflour, and in villages on Sunday evenings there is nowhere to buy more). My mum managed to get it to a roughly ‘thick glue’ consistency, and then came the horribly laborious process of adding it to the chocolate mixture, without it going lumpy. Over about an hour both me and my parents took turns stirring it, but as soon as we increased the heat it would start to go lumpy. It was ridiculous. Never make this custard, just make icing instead. Anyway, I’m watching the end of the World Cup Final, with dwindling hope of finishing the cake. It was supposed to be a donation to my mum’s friend’s Strawberry Tea Fundraiser for breast cancer, so I’m hoping that come morning the custard will be set and my mum will be able to ice it. Oh dear! There were some cakes that were completed this week though. I made Millionaire’s Shortbread for my friend Rachel’s birthday. Laura came to stay and we made delicious brownies today. And my sister baked me an awesome lemon birthday cake (see above). Fingers crossed for more success next week when I will be making peach jam scones. If you want to make this cake, it’s in the Hummingbird Bakery Cookbook. I would type it here, but I feel like I shouldn’t be encouraging people to make it as it has failed so miserably for me (cake excluded I suppose).